1 Remove the core from the pak choi and cut it into 4 parts. Bring stock to the boil. 2 Add ginger, soy sauce and stir to combine. Reduce heat. 3 Add fish. Simmer gently for 1 minute. Add mushrooms and simmer for 1 more minute. 4 Add pak choi and cook for another 2–3 minutes. Stir in sesame oil. 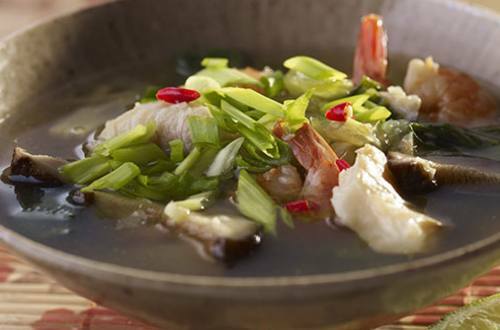 Serve garnished with bean sprouts, coriander and spring onions.